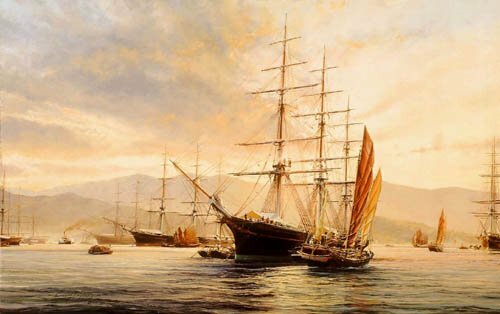 Tea, carried down the Min River from the plantations on Chinese junks, is loaded aboard the Spitfire in Pagoda Anchorage, Foochow, October, 1857. A steam tug approaches, indicating the clipper is almost ready to sail for London, a voyage she will complete in 113 days. Overall print size: 32" x 24"